Other Hausauer researchers on Ancestry.com that connected to the line that I suspected my Margaret was part of had no additional information on her other than her place and year of birth. What little I knew about Margaret when I began searching in earnest recently was what I had been able to gather from online trees and records at Ancestry. It included when and where she was born, when she arrived in America, her parents names, two places of residence for her parents and two places of residence for Henry Buisch’s possible parents. I took that information and did some creative searching. 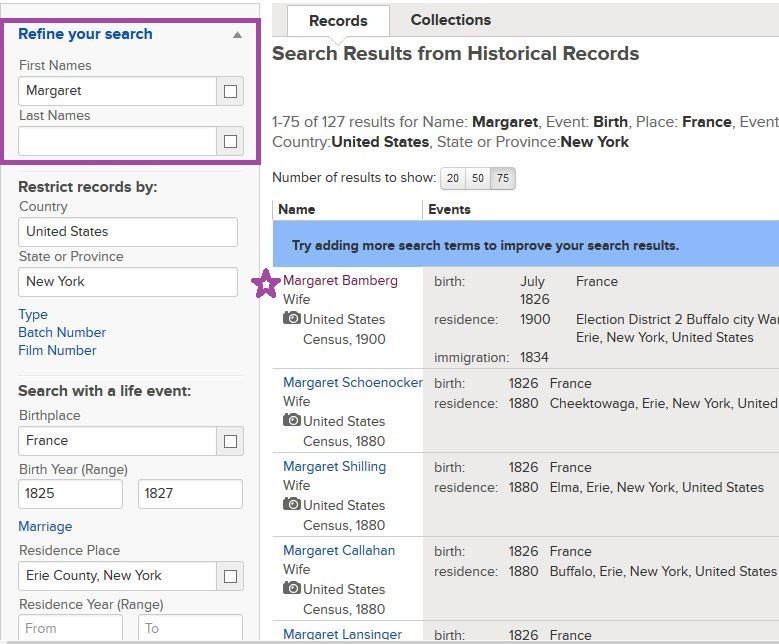 My preference for searching is at FamilySearch.org although I do use the search feature at Ancestry.com in tandem with what I uncover at FamilySearch.org. I just prefer the interface there over the one at Ancestry. Here is how I searched and found Margaret step-by-step. 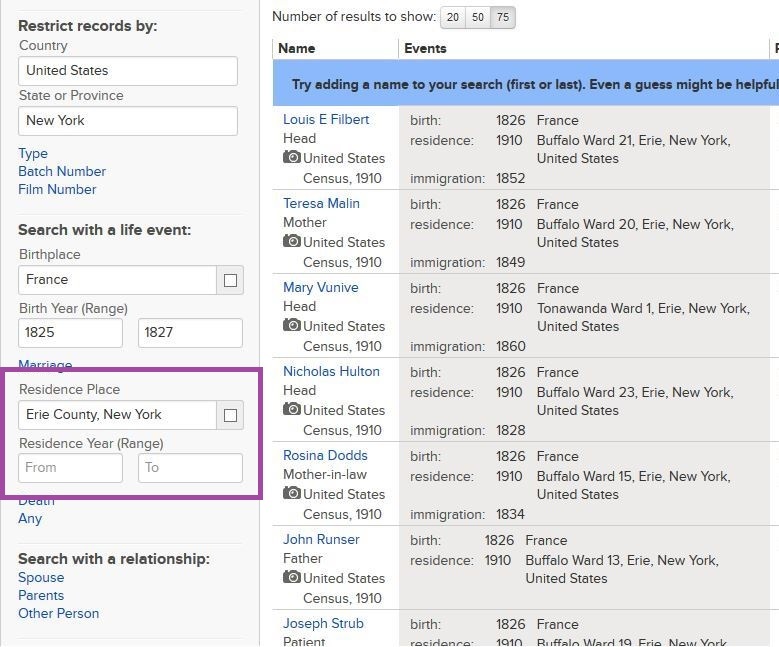 On the main search page at FamilySearch.org [shown above] I left the Name fields blank. 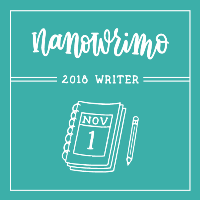 [Yes, you can do that.] I restricted records to United States and New York because my direct lines never left New York. [Or if they did leave, they returned later.] Then I put Birthplace > France and Birth Year (Range) > 1825 – 1827 and clicked Search. The number of records found was 17,735. Time to drill down the results into something more manageable. As shown above, in the search parameters on the left I added Search with a life event > Residence Place > Erie County, New York. That narrowed the search down to 3,769 people. Still a little high. That narrowed down the results to 127. Much more to my liking. Oh, and look, there’s Margaret (Hausauer) Buisch Bamberg in the #1 search result. Voila! And genealogy happy-dancing commenced. [In my head anyway.] In a later post, I will explain how I knew this was my Margaret and what else I have been able to find out about her since then. 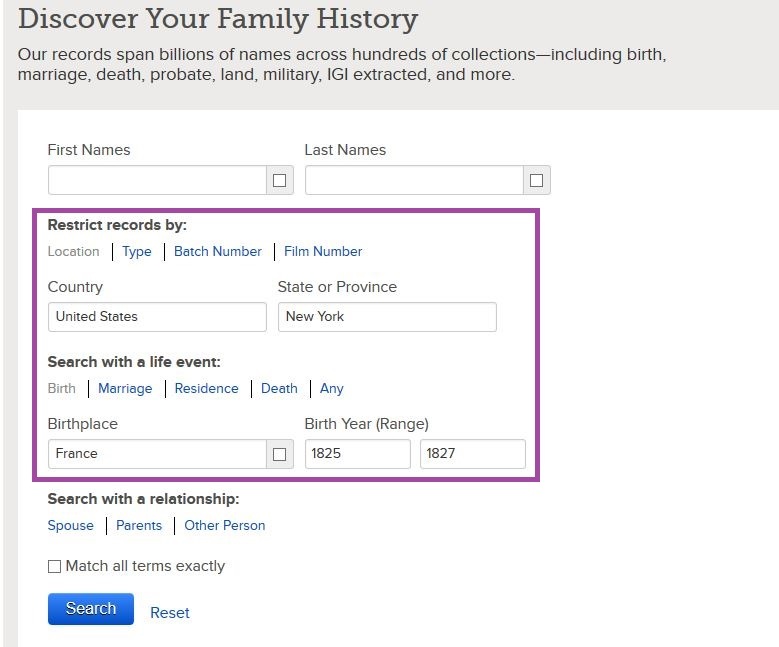 The following Ancestry.com Desktop Education videos were very helpful to me in learning how to do more effective searches at both Ancestry.com and FamilySearch.org. Maybe you will find them helpful as well. Erin Williamson Klein, “52 Ancestors #4 How I Finally Found Margaret (Margaret Hausauer Buisch Bamberg).” My Family History Files, 26 February 2014 (http://myfamilyhistoryfiles.com/buisch/hausauer/52-ancestors-4-how-i-finally-found-margaret/: [access date]).